The Kenya Nyeri Barichu was carefully roasted for you by Onyx Coffee Lab. This fully washed coffee was grown by the Barichu Cooperative in the Nyeri region of Kenya between 1,800 - 1,900 meters above sea level. 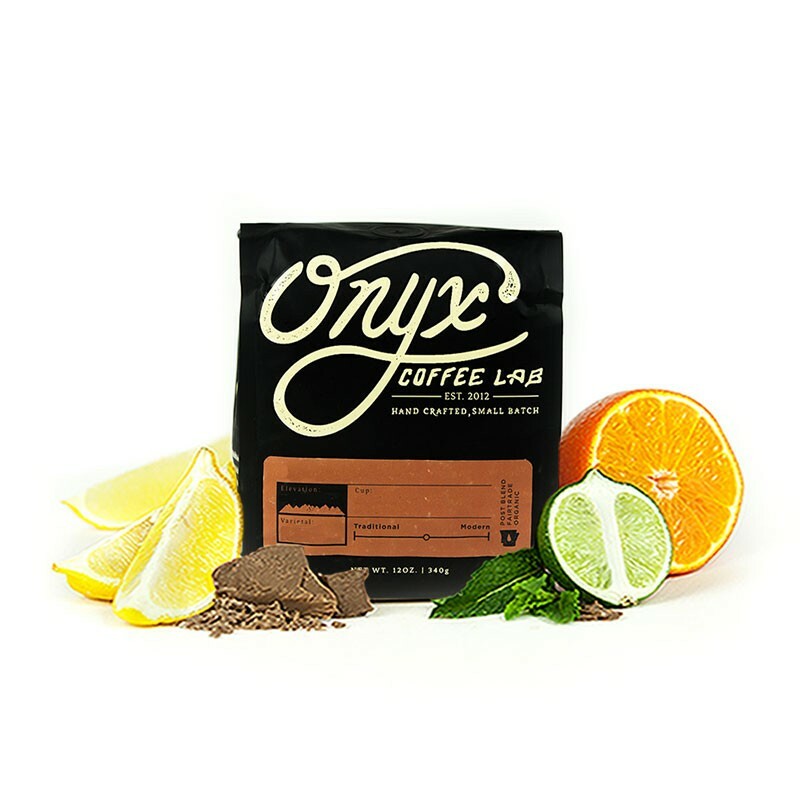 We love this coffee for its nuanced notes of caramel and honey sweetness with a vibrant grapefruit acidity. Really good, I liked how it was strong but also how nuanced the complimentary flavors were. I taste caramel and green apple. It's definitely viscous with a medium-heavy body. It brewed well on a V60 and Chemex. I used a higher ratio of 300 g water to 15 g coffee for this one. With a lower ratio than that, I found the tasting notes muddled, so I suggest experimenting a bit with this one. I'm more of an Ethiopian person but this Kenya was a nice change of pace. This was relatively balanced and pleasant but it didn't blow me away. Perhaps slightly lacking in body and heft. But on the right track and perfectly acceptable! I think we like our coffees a tad more brooding. However the flavors were appealing. dang. this coffee is good. it totally delivers on the notes... high acidity & complexity. delicious. I have brewed it up on a Chemex, V60 & Kalita and it delivers on each method. so far it tastes best in my opinion on the Kalita where a lot of the high notes are cutting through. for a more well balanced cup, it tastes really good on the Chemex too. I really love Kenyans. This one is good but I wouldn't personally give it a great because of the overarching sour taste. Total personal preference. It is not because of under extraction but the strong grapefruit taste I am getting. I like grapefruit but I am almost getting too much of it when I drink this one. If it was more subtle and a stronger stone fruit flavor I may enjoy it a bit more. The mouthfeel is good but again all I can focus on is sour grapefruit. I definitely would try it again and did get more complexity when brewing with the AeroPress. This coffee is very delicate! It starts with a bite of citrus (I'm getting more lemon than grapefruit), and while the acidity is at the forefront, it is not overwhelming - it doesn't linger and clears up quite quickly. Think fibers and spritz vs pulp. The citrus flavors are followed by a buttery smooth medium body, going down with a mildly sweet finish. The notes in the finish aren't as crisp as I would like. I’m seeing folks note caramel flavors, but I’m getting something a little more amorphous. That said, it could be down to the extraction. Which brings me back to my first point - this coffee is delicate! The mix of delicateness and body is definitely not something you see often but it makes for a very interesting cup. I’ve yet to nail an extraction that produces a cup to my liking. I'll continue tweaking the extraction parameters. While I probably wouldn't order this again, this kind of cup is exactly why I signed up for Mistobox: to get me out of my comfort zone and to really think about what I'm drinking in the mornings! This coffee was great. From the aroma to the aftertaste . . . even the after-belches were thoroughly enjoyable. Loved this! Exactly why i signed up for mistobox. A little out of my comfort zone but lovely sweetness balanced with acidity. One of my favorites this year! Overall good cup with strong grapefruit notes and a lingering honey sweetness. Getting a medium body using a V60 for brewing. For Kenyan coffees, I prefer a more berry-forward note than fruity/citrusy. The tangy bitterness is reminiscent of old beans. V60 - Medium body, citrus forward (lemon initially). Very pleasant, would love to try as espresso. Juicy. Exactly what I want. Took awhile to get the extraction right. Really hit all the flavor areas I love so much in lighter blends! There is fruity aspects, the sweetness of earthy candy notes. Almost like a thin fine wine consistency of a coffee..really delicious. Wonderful coffee. A little heavier body than one would usually expect from a coffee of this region, but as soon as you put it through a quick filter brew like a V60, the bright front immediately pop, and you're left with a delightful, fun coffee.